Planned classroom space. Rendering by Robert A.M. Stern Architects of New York City and Newlands & Company, Inc. Although it will be a few more months before the southeast corner of Postle Hall is razed as part of the Phase I Postle Hall replacement, work began in late fall to refurbish three of the building’s five lecture halls before the remaining two are demolished. Work also began on repurposing space in the building’s lower level to create a new Student Commons, which will expand student-dedicated spaces. Temporary construction walls have heightened curiosity and excitement among students, staff and faculty as they look forward to early spring when they will be able to see the first tangible results of the Building on Strong Foundations Campaign. College of Dentistry students, staff and faculty have enjoyed many opportunities to provide input on the new spaces that will result from the Phase I Postle Hall replacement. Appropriate groups have shared feedback on decisions as wide-ranging as what technology should be included in the classrooms to which electric handpiece system is preferred. 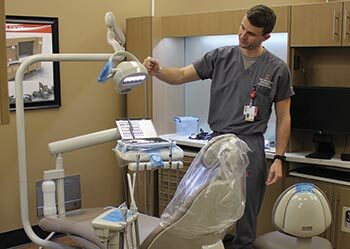 In January, students, staff and faculty were invited to test and provide feedback on full-sized “model” operatories set up by Midmark Corporation in the first-floor dental clinic. The temporary spaces were a close approximation of the operatories planned for the new building and provided student and faculty practitioners with a good sense of the layout and space that will be available in the new student group practice clinics.